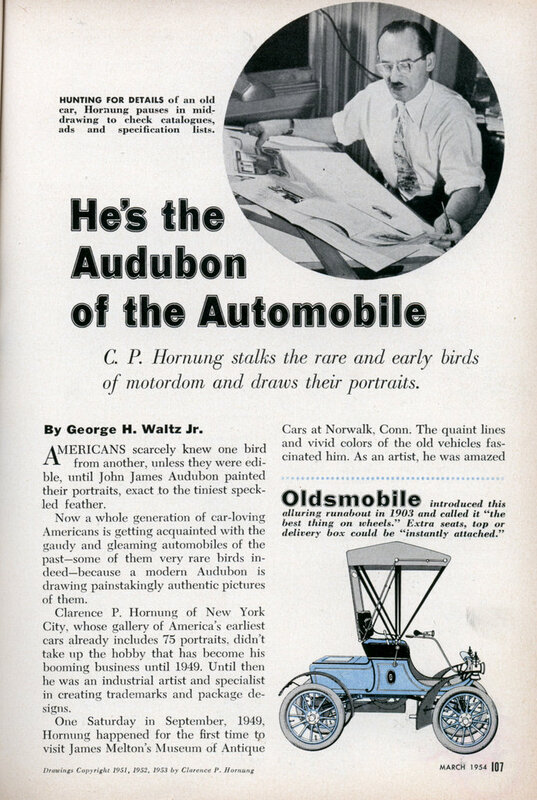 C. P. Hornung stalks the rare and early birds of motordom and draws their portraits. By George H. Waltz Jr.
AMERICANS scarcely knew one bird from another, unless they were edible, until John James Audubon painted their portraits, exact to the tiniest speckled feather. Now a whole generation of car-loving Americans is getting acquainted with the gaudy and gleaming automobiles of the pastâ€”some of them very rare birds indeedâ€”because a modern Audubon is drawing painstakingly authentic pictures of them. Clarence P. Hornung of New York City, whose gallery of America’s earliest cars already includes 75 portraits, didn’t take up the hobby that has become his booming business until 1949. Until then he was an industrial artist and specialist in creating trademarks and package designs. One Saturday in September, 1949, Hornung happened for the first time to visit James Melton’s Museum of Antique to find that no drawings or prints of them were available. 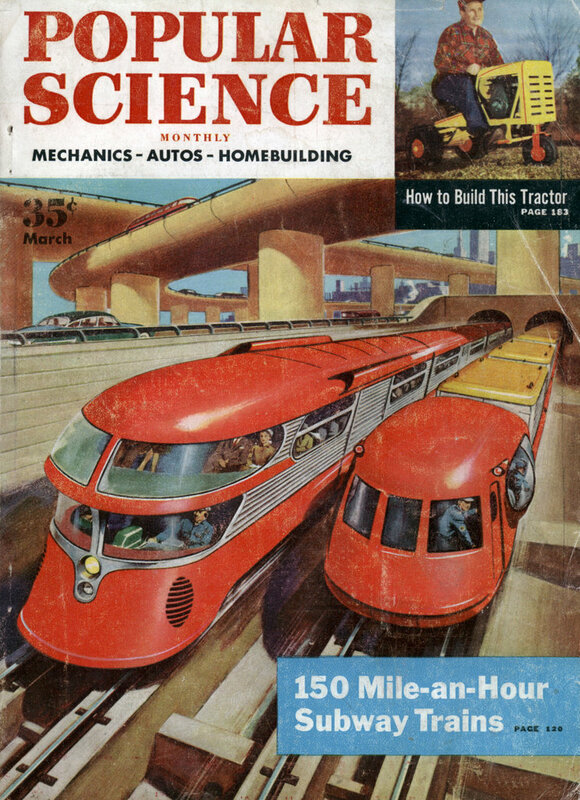 No one up till then had ever made a pictorial history of the American automobile. By the following Monday, Hornung had decided to create that history himself. He plunged into a program of research that in the following months took him to book shops, print dealers, catalogue collectors and old-time car salesmen. He gathered a mounting pile of flyblown catalogues, yellowed newspaper and magazine ads, specification lists and old photographs. Soon he was armed with enough information to produce his first eight portraits: an 1877 Selden, an 1895 Duryea, an 1896 Ford, an 1898 Winton, an 1899 Packard, a 1902 Autocar, a 1903 Olds-mobile and a 1903 Cadillac. When colored prints of them had been run off, Hornung offered them for sale in a few small ads in New York newspapers. The response was astonishing. Hundreds of orders cascaded upon his studio. In two months he sold 2,000 sets. Sud-denly he was researcher, artist, publisher, mail-order clerk and shipping clerk all rolled into one. Happily surrendering to the avid demands of old-car fans, Hornung went back to the “scrap” pile and the drawing board and began producing more portraits of the ancestors of today’s automobiles. To date, 47 prints have been made from the 75 drawings he has completed. He plans to finish 25 additional drawings by 1955. Audubon, wandering in search of bird-life, encountered such feathered eccentrics as White-Eyed Flycatchers and Tell-Tale Godwits. Hornung, in his entertaining research, has happened upon the Auto Bug, the Izzer, the O-We-Go, the Static Super, the Quick and the Zip. Hornung’s “collector’s prints” have been exhibited in museums and libraries all over the U.S. Reproductions of his drawings decorate glassware, lacquered trays, coasters, Christinas cardsâ€”even silk scarves. I have a perfect copy of his 1965 14×22 History of the American Automobile Lithograph collection I am trying to determine it’s value. There were only 500 made and it took 13 years to complete. Jay, i have some of these lithos myself from the 1965 collection. Did you ever find its value? I still haven’t the foggist of what they are worth, I have the complete set of 100 lithos and I have ony found them in tow musems so far. No one knows what they are worth. Keep me posted if you hear anything. I did see indiviuals sell on ebay for $50 each. i did not see the follow up comment at bottom if comment is left,please notify here. It apears we are in the same situation. Like you I have a perfect set of lithos also. I have ran into dead ends on determing the value. If you hear of anyone who is an expert please let me know. I have a couple of more things I will try on my end and will keep you posted. this appraisal was for an incomplete set of 86 plates. If anyone knows of an interested buyer for these, post a comment here and I’ll get an email notification. value, please add me to the list of people “wanting to know.” Thanks. I too have a complete boxed set which I have owned since 1976. It was presented to me on a special occasion by an automotive aftermarket ad agency. My set is in pristine condition. I have not been able to establish its value. I also have a set. Eager to find a value and a buyer.